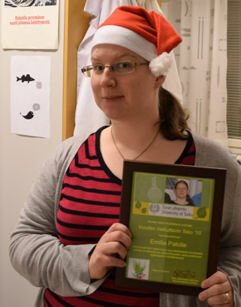 Yesterday, Emilia Palo was awarded by the Department of Chemistry with the “Most Impressive Action of 2015” for e.g. creating the inorganic.utu.fi web pages. Congratulations! This entry was posted in 2015, awards by Mika Lastusaari. Bookmark the permalink.